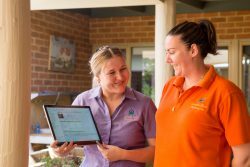 Identifying the staff in your organisation who will become system super users is recommended for any aged care provider implementing a new software. This is beneficial if the organisation is moving away from paper-based care for the first time, or switching from one clinical management system to another. Recognising super users and encouraging them to form an expert group helps other staff to get on board with the new system and its implementation. Super users also help to facilitate staff education. A degree of change management is involved in implementing any new technology. A positive approach and ongoing training are critical to the successful implementation of a new clinical management system. Some staff will be more reluctant than others to move to a new system, this may depend on how familiar they are with technology. For those who do have reservations about the new system, guidance and a clear demonstration of systems benefits can assist. Super users will need to work with these staff to encourage them to embrace the change and involve themselves in training. Your super user group will become experts in the clinical management system. They will then assist in cascading this knowledge throughout the organisation to other staff. This is both time and cost effective in comparison to other traditional training methods. Super users will be involved in formal training sessions with your system provider during implementation. They should also be involved in workshopping to ensure your organisation’s workflows are embedded into the new system. Once super users are confident in their knowledge they can begin to assist others. This allows training to be conducted at a time that is suitable for staff and their availability. Staff can be trained in different areas of the system gradually without being bombarded with information. Refresher training can also be performed as it is required. This is important as staff may not always retain all they were taught during this busy period. Positivity increases when staff are supported to learn the system adequately. Commitment from all staff eases the upheaval of change management and leads to a successful implementation. Using this training method helps support staff to use the system to its greatest potential, maximising your return on investment.